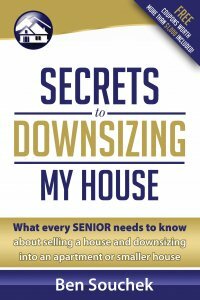 Are you, your parents or grandparents considering selling a house and possibly downsizing? Not sure of your options at this point or what might be the best way to move forward? My name is Ben Souchek and I’m with Home Downsizing Solutions. We are a professional home buying company that does all that we can to make selling a house as straightforward, stress free and hassle free as possible. I am also a licensed agent. I do not list houses for individuals and do not really act like an agent, but I do have a license. And we work with agents so that in circumstances where we might not be the best solution with buying a house from individuals, that we can offer other solutions to home sellers. Maybe you’re at a point where you’re just not quite sure what step is next or what to do. The typical steps that individuals go through is obviously thinking about downsizing and selling a house. Understandably, a lot of people do not want to sell a house and downsize if they really don’t have to, but sometimes it just makes sense. Maybe the house has stairs and as a homeowner it it’s not very convenient anymore or it’s impossible to get up and down stairs, or very stressful anyway. Maybe it’s a larger house than you really need and so the maintenance is not something you want to tackle anymore. Potentially snow removal or lawn care, depending on what parts of the country you’re in. Maybe the the upkeep on the house such as painting and just keeping the house up to date or maintained is more than a person wants to do at this point. You, your parents or grandparents are in a situation where you’re forced to move, maybe you have a life changing situation, a life altering situation, or maybe you’ve lost a spouse. There’s a lot of different circumstances where it kind of forces a person to make that transition. So if you’re at that point where you’re not quite sure what to do or what options you have available, just know that you probably have more than one. 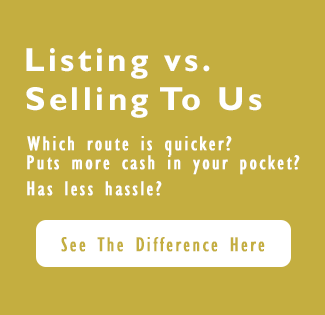 That’s why I really like to be able to offer the services that we do because we can offer multiple solutions when a person wants to sell and downsize their house. The other benefits people find beneficial, the reason that they work with us in the first place, a lot of people ask, why would you sell to a home seller, one of those cash buyer companies? And for us, one, we’ve been in business for over 20 years at this point and so hopefully we’re doing some things that bring benefits to a person that’s looking to sell a house. But the primary reasons that a person will sell to us is if they’re looking for, again, a straightforward, stress free way to sell a house where they don’t have to worry about improving or updating a house just to make it market ready. They don’t have to worry about showing the house to potential buyers, especially non serious buyers showing up at the last minute and wanting to look at the house and inconvenience in their lives. We purchase houses as is so that a person doesn’t have to do any updates. They don’t have to worry about any of that. The seller can take what they want, sell what they want, and any of the stuff that they don’t want any longer they can just leave and we’ll take care of it. And we’ll even sometimes help with moving expenses and arranging those services for a person. So again, we try and do everything that we can to make it as stress free and hassle free and create an environment where we can make that transition as easy as possible for a home seller. If we can help you out, please check us out at www.homedownsizingsolutions.com, that’s homedownsizingsolutions.com and we’d be happy to assist in any way that we can for you. Thank you.